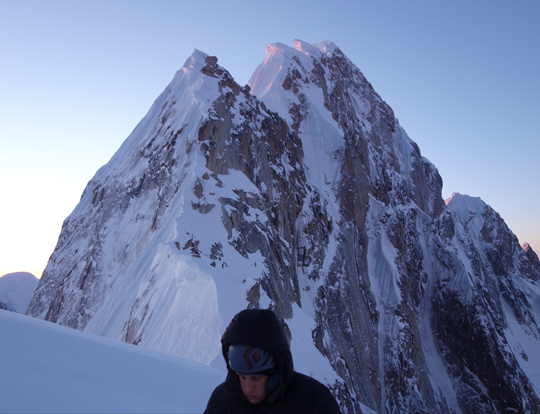 After climbing in alpine style for 36 hours, Brad Farra, John Frieh and Jason Stuckey arrived back at the base of Alaska's Mt. Huntington (12,240') on March 3. 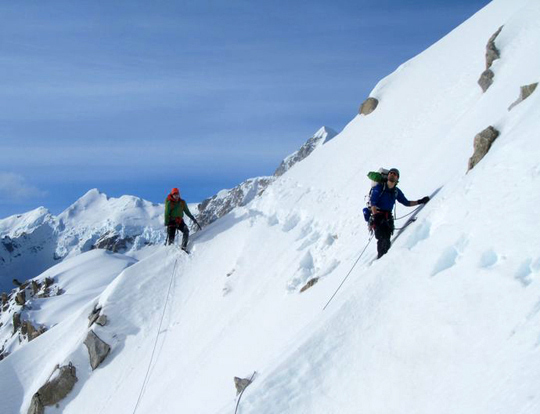 They had followed in the half-century-old footsteps of Lionel Terray's 1964 expedition up the Northwest (aka "French") Ridge (80�, 7,000') to make the route's first winter ascent and the third winter ascent of Huntington overall. Inspired by Terray's climb—during which the Frenchman injured his elbow in a fall, descended, then couldn't resist going back up the mountain to summit—and the aesthetics of Huntington's uniformly difficult slopes, Frieh and Stuckey first climbed Huntington in 2011. 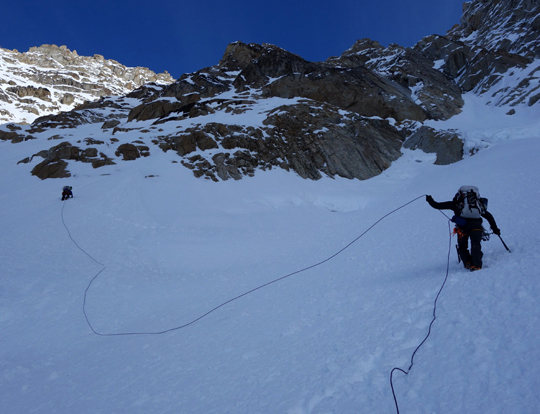 It marked the second winter ascent of the mountain, by the West Face Couloir (aka "Nettle-Quirk"; V 85�, 3,250'). Then, Frieh realized a winter ascent, if timed properly, "would be the best time to encounter minimal slogging and, more importantly, minimal cornices." Before trying Huntington, both Frieh and Terray waited. Frieh watched for a weather window; Terray made regular phone calls to Bradford Washburn to make sure the peak was still "virgin." 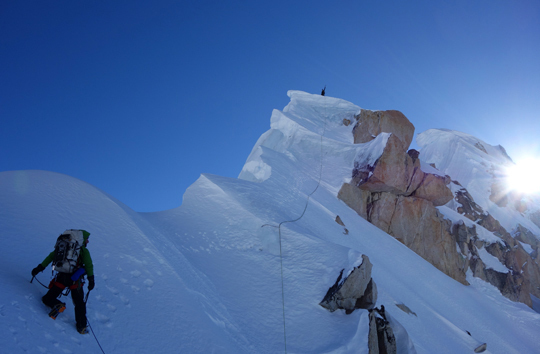 Farra, Frieh and Stuckey's window was spotted, and after consulting with local climber and trusted pilot Paul Roderick, the three climbers committed to the route. They began on March 1 as soon as they stepped off the plane and onto the Tokositna Glacier, forgoing a base camp of any kind, but deep, sugary snow made just getting to the base of the climb difficult. They bivied near 10,500 feet. "To be honest, we all (mostly me) underestimated how long it would take to gain the ridge; I guess I was under the impression it didn't require much vertical gain," Frieh wrote. Frieh wasn't the first to underestimate Huntington. Though Terray thought about the mountain for years before his attempt, it was his secondary objective in 1964. He planned, with eight other men, to use Huntington as a warm-up for what would become the Cassin Ridge. "Instead," Wadman wrote in Alpinist 20, "the Frenchmen endured polar cold as they cut steps up steep, hard ice—some of the most difficult...of his entire life." 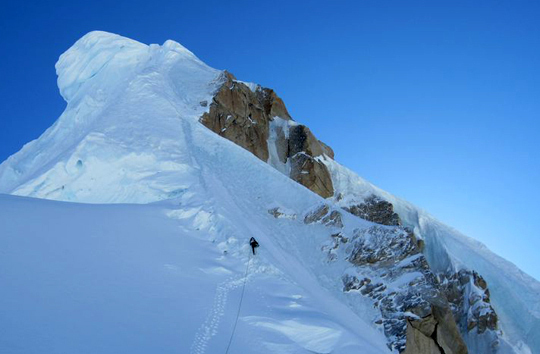 The team reached the summit around 11:00 p.m., after climbing for 15 hours, and bivied just below the top. Frieh battled a cold and said he was thankful for the support of Farra and Stuckey: "I'm guessing they secretly liked having the fat guy in the back as a moveable anchor in case a cornice did break," he joked. Farra, Frieh and Stuckey descended for six hours to the glacier, then headed back to Talkeetna with a feeling of victory akin to Terray's, whose comrades would, "[n]ow and again...yodel and shout for joy. After all the painful, gloomy days, we have a marvelous-sensation of liberation."